King Nabopolassar, Ancient Babylonian “Archaeologist” ? Most readers of history will recall how the mighty juggernaut Assyria finally fell at the hands of the rebel Babylonians and how Nineveh was sacked in 612 BCE at the able hands of Nabopolassar, Babylon’s new warlord king. Fewer readers know he rebuilt temples in his spare time after carefully studying plans and foundations, examining records in his archives and surveying ancient sites. Whether it was for religious motivation or intellectual curiosity, he was clearly careful in studying the Mesopotamian past. 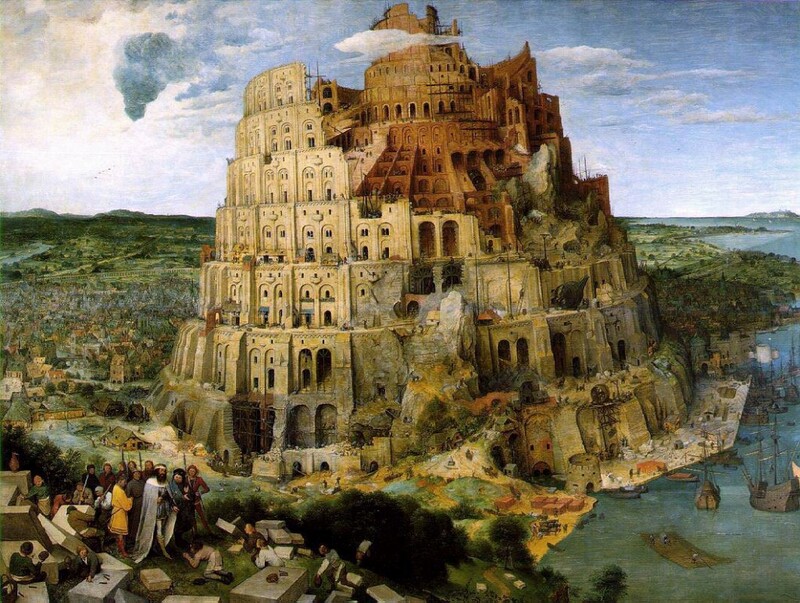 How could King Nabopolassar of Babylon be considered an “archaeologist” given that the discipline as we know it is barely a few hundreds of years old? Yet certain aspects of habitual behavior can indeed reflect interest in what we can term “archaeological” even millennia past. The reversal of fortune for the Assyrians was long in coming after they had conquered a huge swath across much of the Near East from eastern Iraq to the Mediterranean and even Egypt for centuries, from the mountains of Anatolian Urartu to the Persian Gulf through desert waste and farmland alike. Having laid waste to fortress city after city and enslaving untold thousands in their path, the Assyrians were as much hated as feared, their self-styled kings of kings often celebrating their heavy-bearded macho with cruelty to their humiliated captives, like brutal Ashur-Nasirpal II (ruling 883-859 BCE) boasting of “cutting off lips, noses, ears of rebels” and elsewhere of putting out the eyes of royal children in front of their parents and dragging the kings and queens away with bronze hooks in their tongues. The little book of Nahum in the Hebrew Minor Prophets sings a false lament with relief about Nineveh’s fall: “Woe to the city of blood, full of plunder, never without victims, the crack of whips, piles of dead… Nineveh in ruins, who will mourn for her?” (Nahum 3:1-7 excerpted). While this Assyrian hegemony was now finishing its second surge as Neo-Assyria, just as Old Babylon of the Middle Bronze Age under such legendary rulers as the law-giver Hammurabi (ruling ca. 1792-50 BCE) had long passed and was now to become Chaldean Neo-Babylon in its rebirth, the upstart Babylonian leader Nabopolassar laid siege to Nineveh in 612 BCE when Assyrian power was waning, when the plundering had stopped and there was nothing left to fill their coffers. Perhaps an economy based on vassalage tribute, plunder and loot had been artificially engorged and was collapsing on itself. In any case, Nabopolassar did what no one else had done before – marched on the proud capital city and took it, burning its timber roofs to ash and charcoal and ironically firing its clay archives so that the event of its destruction also preserved its records, as the 30,000 clay tablet Royal Assyrian Library at the British Museum shows. The above ca. 1563 painting of Bruegel, while not at all about Nabopolassar or even necessarily Neo-Babylon, imaginatively portrays the mythical Tower of Babel being built on the Plain of Shinar near where Babylon (derived from the Septuagint Greek version of Bab-El in Gen. 11). As an extrapolation of the Colosseum actually observed in Rome by the artist on his travel stay in Rome in 1552-53, Bruegel has its construction employing Renaissance tools and wheeled mechanisms around the cylindrical arcaded levels resembling the Roman landmark. In unusual humility for a king, several times on the cylinder Nabopolassar has his scribes mention he was a nobody and anonymous before the gods raised him to leadership. In return, his devotion also restored the civic pride of Babylon. The restored and rebuilt temples, sacred enclosures and shrines in his inscription include those of Ishtar, Ninurta, Enlil, Ea and others. The Igigi were Babylonian heavenly deities thought to be mostly involved in supervising the digging canals, moats and related hydrology irrigation functions. Sometimes rebellious, as in the Atra-Hasis flood myth, they may number from 10-300. The universal archaeological tasks involved in Nabopolassar’s inventory are carefully ordered. First, he details the fallen condition: 1) “which had weakened and collapsed because of age”; 2) “whose walls had been taken away because of rain and deluge”; 3) “whose foundations had heaped up and accumulated into a mound of ruins”. Therefore, Nabopolassar could recognize the aged weathering of ancient brickwork no longer capable of structural weight-bearing load and knew that unfired brick in particular would dissolve back to mud after long-term exposure to rain and excess water. What he found as ruins he knew had prior historic use. Second, Nabopolassar’s plan was to utilize tools and forced labor to lay bear the buried remains after faithfully establishing their contexts: 4) I had them use the hoe and imposed the basket of conscription on them. From the bank of the Arhtu canal, on the lower side near the Urash gate, 5) I removed its accumulated debris. Here, Nabopolassar demonstrates that the remains were partly subsurface and required excavation due to accumulation through time. Third, Nabopolassar’s seemingly most exacting archaeological task involved quantitative topographical analyses and careful recording: 6) surveyed and 7) examined its old foundations 8) and laid its brickwork in the original place. To an archaeologist, these phrases of Nabopolassar leap out because this is exactly how the discipline operates by stratigraphic and mathematical principles to make sure survey benchmarks and cardinal directions are recorded in order to contextualize remains. His use of “examined” demonstrates careful observation. Finally, Naboplassar summarizes his findings and records them for an unknown posterity on this clay cylinder and identifies himself as the project director responsible for the work: 9) I, Nabopolassar, the one who discovers (inscribed) bricks from the past, 10) the one who implements the work on the original. By claiming the “discovery” as something from the “past”, Nabopolassar also makes sure he doesn’t just abandon the remains but also “implements” the restoration on the “original foundations”. By precedent, was Nabopolassar first and foremost a logical military leader who could take down Nineveh by utilizing similar advance careful observation, planning and strategy? 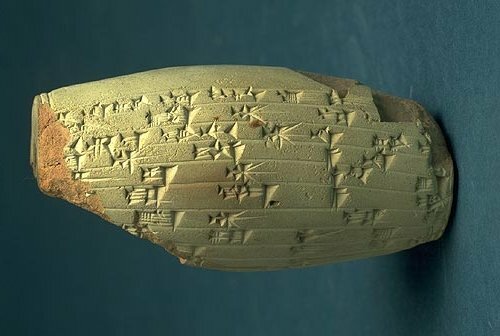 Regardless of whether or not his archaeological work was done for religious reasons to please the gods he claimed gave him his reign and apparently secured his Neo-Babylonian dynasty, Nabopolassar’s Cylinder gives us the best evidence for carefully contexted and recorded material history over 2,500 years ago, just about 2,350 years before archaeology became a scientific and historical discipline. Was Nabopolassar thus history’s first known archaeologist? Diana Pickworth. “Excavations at Nineveh: The Halzi Gate.” Iraq [British Institute for the Study of Iraq] 67.1 (2005) 295-316, esp. fig. 1 on 296 and 298. These texts are translated and discussed by F. N. J. Al-Rawi. “Nabopolassar’s Restoration Work on the Wall Imgur-Enlil at Babylon.” Iraq 47 (1985) 1-13; and P.-A. Beaulieu. “Nabopolassar’s Restoration of Imgur-Enlil, the Inner Defensive Wall of Babylon.” The Context of Scripture, W. W. Hallo, ed. Leiden: E. J. Brill (2000) vol. 2, 307-8. Note: the author was a post-doctoral Research Fellow under Prof. David Stronach at U.C. Berkeley’s Near Eastern Studies Dept. from 1992-95 and worked on post-processual Nineveh material under Stronach.